New Scheduling Procedures We depend on the generous donations and time from our donors and volunteers. To ensure the efficient operation of our time and yours, we request that you schedule all drop offs in advance. General Donations –may be dropped off during normal operating hours. Donations/Deliveries (involving a truck or trailer of any kind) – Must be scheduled as early as possible, and not less than 24 hours in advance. For larger deliveries, this is essential to assure that the warehouse can be staffed with volunteers who are trained/skilled at assisting you at the time you need to have your delivery unloaded, and if necessary, to schedule an alternate delivery time. If you do not schedule at least 24 hours in advance, we cannot guarantee that the warehouse will be open for your delivery. Please be courteous of our volunteers and give them as much lead time as possible. Deliveries from 18-wheeler trucks – it is required that you schedule your drop off/unloading so that we can assure to have trained personnel on site. We receive a lot of last minute calls from trucks en route with deliveries arriving at odd times and days. For your safety and our liability, please contact 615-341-9961 to schedule your delivery at least 48 hours in advance. Group Scheduling In order for us to be able to prepare activities for you and to maximize your volunteer experience, please schedule your group at least 1 week in advance by contacting 256-341-9961 or email RayLCr@aol.com. This will enable us to prepare supplies/activities for you group, so that we operate with efficiency and make wise use of your time and ours. Having multiple large groups showing up impromptu guarantees a mediocre experience for all. We want this to be a GREAT experience for your group, and appreciate your cooperation in this matter. RULES No open toed shoes and minimum age is 12. Age requirements may vary with Vacation Bible Schools with additional adult supervision. The average age of our volunteers is 74. We have sit down jobs as well as stand up jobs. Work rooms are heated and air conditioned. Volunteers drove two-an-a-half hours one way from Olive Grove, MS to help the less fortunate. 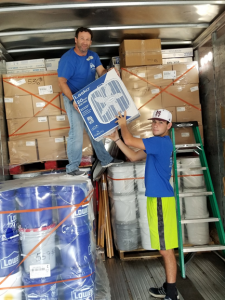 On September 4, 2017 a full truck load of disaster relief supplies left the United Methodist Disaster Relief Warehouse in Decatur, AL for victims of Hurricane Harvey. They were shipped to Christ UMC in Sugarland, Texas. A second shipment went to St. Luke-Simpson UMC in Lake Charles, Louisiana. As Hurricane Harvey survivors begin the recovery process. Other states are bracing for the onslaught of Hurricane Irma and following it, Hurricane Jose. We know that churches only have so much budgeted for disasters. Hurricane Irma is reported to be the largest hurricane in history and right behind that is Hurricane Jose. Methodists are working together as these storms approach Americas coast lines. The items we are collecting are designed to help people get back into their homes as soon as possible. (See the list of needed items below.) However, we have to remember that anything that is given to a victim can become a storage problem if it goes beyond the necessary items for cleanup. I they are living in a shelter or civic building, they have no storage at all. Please keep this in mind as you decide what your contribution can be. When their homes are again livable, they can accept items to live a “new normal life.” At this time, let’s try to get these people back into their homes by Christmas. Then they will need furnishing, etc. But for now, let’s help them get back into their homes. Please re-double your efforts to be the hands and feet of Jesus. Thank you, Ray Crump Director UM Disaster Warehouse 3220 Highway 31 South Decatur, Alabama 35603 256-341-9961 We are responding with the following supplies: Box Fans (To dry out houses following flooding) 25’ heavy duty extension cords (To move the fans around inside homes) 2 & 3 gallon garden sprayers (to fight mildew and mold) Flat billed shovels (removal of mud, wet carpet, pads, sheet rock, insulation, etc.) Rakes (removal of tree limbs, leaves and muck from inside home and yards) Wheel barrows (2 wheeled, so they will not turn over going to the street) ** 3 M mask respirators Series “N 95” numbers 100, 8293, 8200, 8511, & 8210 (to protect residents and workers while working in mildew and mold. This item is our greatest need.) Conference communictions people, please disseminate the following information to all your conference churches immediately. Thank you! With Hurricane Harvey at a level of category 4, the United Methodist Disaster Relief Warehouse is responding again. We are only able to do this because your local church keeps our doors open. It is that $10/month that people donate. Now United Methodists are responding. We are responding with the following supplies: Box Fans (To dry out houses following flooding) 25' heavy duty extension cords (To move the fans around inside homes) 2 & 3 gallon garden sprayers (to fight mildew and mold) Flat billed shovels (removal of mud, wet carpet, pads, sheet rock, insulation, etc.) Rakes (removal of tree limbs, leaves and muck from inside home and yards) Wheel barrows (2 wheeled, so they will not turn over going to the street) Now we need to replace these supplies. You may find these on sale at your local stores, or make a donation by PayPal or mail a donation to U. M. Disaster Relief Warehouse, P.O. Box 1133, Decatur, AL 35602. For more information give us a call at 256-341-9961. On Sunday night, April 30, 2017, twenty-six tornados tore through middle Mississippi leaving 600 homes damaged, leveling one hundred of them. On Wednesday afternoon, the Conference Disaster Coordinator for the Mississipi Annual Conference called the Warehouse requesting relief supplies. Thursday morning at 6:45 a.m. saw volunteers arriving at the Disaster Warehouse with pick-up trucks and trailers. The first trailer was loaded and out the door by 9:45 a.m. heading for Mississippi. Three more trailers left before 10:45 a.m. that day. The trucks and trailers carried 569 Tornado Buckets, 30 rolls of 100-foot tarps, around 440 smaller tarps, along with hammers, roofing nails, nailing strips, and a trailer load of boxes for packing salvageable items to be distributed by the local United Methodists. You sent four trailor loads! Thanks everyone! Prior to the April 30 storms, the shelves of the Warehouse had been filled with 677 Tornado Buckets put together by volunteers. With the shipment to Mississippi that week, we were left with 77 tornado buckets in the warehouse. Please help replenish these supplies. It seems like every week there is bad weather somewhere in our area, but no one knows where the next disaster will occur. Your help is needed! Financial donations for supplies can be mailed to the U.M. Disaster Relief Warehouse, P.O. Box 1133, Decatur, AL 35602, or call us at 256-341-9961and come see all that is going on! You will be glad you came! Methodist missionaries have already requested “way more” Christmas shoe boxes this year than last year. Do you have your Shoe boxes? Larry and Karen Fite have felt God’s call to help Native Americans since their teens. As young people dating during the 1970s, they dreamed of traveling and working with missions to Native American people in the U.S. After their marriage in 1975, they were faced with needing to care for disabled and ill family members, so they put their dreams on hold for a time. In their church, Gandy’s Cove United Methodist Church, in Falkville, Alabama, they became involved with the missions activities. Years passed, and then about ten years ago, while delivering UMCOR kits put together by the UMW at Gandy’s Cove to the Disaster Warehouse in Decatur, Alabama, the Fites met Director Ray Crump. Ray encouraged them to stay and help in the Warehouse that day. “Ray was always encouraging and eager for us to help in spite of whatever physical problems we may have,” Karen remembers. This encouragement was particularly meaningful to the Fites since Larry Fite has Parkinson’s disease. “Ray has a talent for seeing past the disabilities and seeing where our talents are and where we can best be used by God,” Karen said. The first time they stayed to help, Ray asked Larry to help with identifying donated medications and labeling them for appropriate use. As Larry is a retired Medical doctor, the task fit his abilities perfectly. A UMW friend asked if the Fites would be interested in going on an Appalachia mission in 2015. Larry knew this was one he could be a part of, in spite of his disability. “We traveled to the Hinton Rural Life Center in Hayesville, N.C. with a team of volunteers, and helped with a painting project,” Karen said. Larry worked hard and met the challenges that arose with dignity. In 2016, Karen and Larry began talking again about the dreams they had of helping Native Americans in their younger days 40 years prior. They decided they weren't getting any younger and if they were going to make those dreams come true, the time was now. So Karen contacted the Volunteers in Mission (VIM) office of the United Methodist Church and asked if there were any mission opportunities for older adults -- one with a disability – who were called to work with Native Americans. Of the three mission possibilities Karen received from VIM, the first to respond to her query was Linda Garriott, the director of the Tree of Life Mission on Rosebud Reservation located in Mission, South Dakota. “We felt an immediate connection with Linda and we knew this was the mission God was calling us to be part of,” Karen said. “We began gathering items to send to the Garriotts at the Tree of Life Mission in February, 2016. In March, we realized the outpouring of donations was far greater than we could afford to mail by USPS, so we called Ray for advice.” As a result, volunteers from Gandy’s Cove UMC in Falkville, and Southside Baptist Church Women on Mission group from Decatur worked at least once a week through March and April to prepare the donations at the Warehouse. Once the word was out about the project, many other churches made donations, including Hamby’s Chapel UMC, Eva UMC, Falkville First UMC, First UMC in Decatur, Asbury UMC in Madison, Madison UMC, First Baptist in Decatur, Calvary Church in Chattanooga, Tenn, First Baptist Church in Clinton, Tenn, Eva Senior Center and many other volunteers from churches visiting the UMCOR warehouse on the days packing was taking place. The shipment from the Warehouse included UMCOR health kits and school kits, along with shoes, clothing, toys and many other items from the Warehouse. The shipment arrived in South Dakota while the group of volunteers from Gandy’s Cove was there on a mission trip. They were able to see the needs first-hand and experience the gratitude of the Lakota Sioux Reservation staff and Tree of Life Mission. Spring 2017 Newsletter Here is a report from Lutts, TN on Youtube. John Montgomery was one driver on four (4) shipments the United Methodist Disaster Relief Warehouse made to Lutts. While he was there he took some pictures and pulled others from a different source. It is about ten minutes long, but I think you will enjoy it. We would love to hear your reaction after viewing it! Also, attached in our report that goes to Sager Brown each month telling what the United Methodist supply network AROUND THE WORLD has ready to ship. In addition, see the disbursement report for December. You helped make this a reality. I just read a news report that stated around Missouri, the Mississippi River has ten (10) times the amount of water passing that area that usually comes over Nigari Falls every minute. Eleven levies have been compromised and people are fleeing the flood waters up there. This is all headed our way. The United Methodist Disaster Relief Warehouse is low on: Cleaning buckets (We have empty buckets, insect repellent, leather gloves and garbage bags for you.) Garden Sprayers (2 and 3 gallon sizes for mildew and mold) Box Fans (flat billed shovels) Health kits Drivers and Communication people (Pickup truck drivers & riders to deliver supplies) GPS If you can help, please let us know. Thanks you and may God richly bless you in 2016. We are very grateful for the love and service of so many that enable us to jointly respond to the basic survival needs of so many. Check this site for any changes in operating hours and for NEW scheduling guidelines. We depend on the generous donations and time from our donors and volunteers. To ensure the efficient operation of our time and yours, we request that you schedule all drop offs in advance. General Donations –may be dropped off during normal operating hours. Donations/Deliveries (involving a truck or trailer of any kind) – Must be scheduled as early as possible, and not less than 24 hours in advance. For larger deliveries, this is essential to assure that the warehouse can be staffed with volunteers who are trained/skilled at assisting you at the time you need to have your delivery unloaded, and if necessary, to schedule an alternate delivery time. If you do not schedule at least 24 hours in advance, we cannot guarantee that the warehouse will be open for your delivery. Please be courteous of our volunteers and give them as much lead time as possible. Deliveries from 18-wheeler trucks – it is required that you schedule your drop off/unloading so that we can assure to have trained personnel on site. We receive a lot of last minute calls from trucks en route with deliveries arriving at odd times and days. For your safety and our liability, please contact 615-341-9961 to schedule your delivery at least 48 hours in advance. In order for us to be able to prepare activities for you and to maximize your volunteer experience, please schedule your group at least 1 week in advance by contacting 256-341-9961 or email RayLCr@aol.com. This will enable us to prepare supplies/activities for you group, so that we operate with efficiency and make wise use of your time and ours. Having multiple large groups showing up impromptu guarantees a mediocre experience for all. We want this to be a GREAT experience for your group, and appreciate your cooperation in this matter. No open toed shoes and minimum age is 12. Age requirements may vary with Vacation Bible Schools with additional adult supervision. The average age of our volunteers is 74. We have sit down jobs as well as stand up jobs. Work rooms are heated and air conditioned. Volunteers drove two-an-a-half hours one way from Olive Grove, MS to help the less fortunate. On September 4, 2017 a full truck load of disaster relief supplies left the United Methodist Disaster Relief Warehouse in Decatur, AL for victims of Hurricane Harvey. They were shipped to Christ UMC in Sugarland, Texas. A second shipment went to St. Luke-Simpson UMC in Lake Charles, Louisiana. As Hurricane Harvey survivors begin the recovery process. Other states are bracing for the onslaught of Hurricane Irma and following it, Hurricane Jose. We know that churches only have so much budgeted for disasters. Hurricane Irma is reported to be the largest hurricane in history and right behind that is Hurricane Jose. Methodists are working together as these storms approach Americas coast lines. At this time, let’s try to get these people back into their homes by Christmas. Then they will need furnishing, etc. But for now, let’s help them get back into their homes. Please re-double your efforts to be the hands and feet of Jesus. Conference communictions people, please disseminate the following information to all your conference churches immediately. Thank you! With Hurricane Harvey at a level of category 4, the United Methodist Disaster Relief Warehouse is responding again. We are only able to do this because your local church keeps our doors open. It is that $10/month that people donate. Now United Methodists are responding. Now we need to replace these supplies. You may find these on sale at your local stores, or make a donation by PayPal or mail a donation to U. M. Disaster Relief Warehouse, P.O. Box 1133, Decatur, AL 35602. For more information give us a call at 256-341-9961. On Sunday night, April 30, 2017, twenty-six tornados tore through middle Mississippi leaving 600 homes damaged, leveling one hundred of them. On Wednesday afternoon, the Conference Disaster Coordinator for the Mississipi Annual Conference called the Warehouse requesting relief supplies. Thursday morning at 6:45 a.m. saw volunteers arriving at the Disaster Warehouse with pick-up trucks and trailers. The first trailer was loaded and out the door by 9:45 a.m. heading for Mississippi. Three more trailers left before 10:45 a.m. that day. The trucks and trailers carried 569 Tornado Buckets, 30 rolls of 100-foot tarps, around 440 smaller tarps, along with hammers, roofing nails, nailing strips, and a trailer load of boxes for packing salvageable items to be distributed by the local United Methodists. You sent four trailor loads! Thanks everyone! Prior to the April 30 storms, the shelves of the Warehouse had been filled with 677 Tornado Buckets put together by volunteers. With the shipment to Mississippi that week, we were left with 77 tornado buckets in the warehouse. Please help replenish these supplies. It seems like every week there is bad weather somewhere in our area, but no one knows where the next disaster will occur. Your help is needed! Financial donations for supplies can be mailed to the U.M. Disaster Relief Warehouse, P.O. Box 1133, Decatur, AL 35602, or call us at 256-341-9961and come see all that is going on! You will be glad you came! Methodist missionaries have already requested “way more” Christmas shoe boxes this year than last year. Do you have your Shoe boxes? Larry and Karen Fite have felt God’s call to help Native Americans since their teens. As young people dating during the 1970s, they dreamed of traveling and working with missions to Native American people in the U.S. After their marriage in 1975, they were faced with needing to care for disabled and ill family members, so they put their dreams on hold for a time. In their church, Gandy’s Cove United Methodist Church, in Falkville, Alabama, they became involved with the missions activities. Years passed, and then about ten years ago, while delivering UMCOR kits put together by the UMW at Gandy’s Cove to the Disaster Warehouse in Decatur, Alabama, the Fites met Director Ray Crump. Ray encouraged them to stay and help in the Warehouse that day. “Ray was always encouraging and eager for us to help in spite of whatever physical problems we may have,” Karen remembers. This encouragement was particularly meaningful to the Fites since Larry Fite has Parkinson’s disease. disabilities and seeing where our talents are and where we can best be used by God,” Karen said. The first time they stayed to help, Ray asked Larry to help with identifying donated medications and labeling them for appropriate use. As Larry is a retired Medical doctor, the task fit his abilities perfectly. A UMW friend asked if the Fites would be interested in going on an Appalachia mission in 2015. Larry knew this was one he could be a part of, in spite of his disability. “We traveled to the Hinton Rural Life Center in Hayesville, N.C. with a team of volunteers, and helped with a painting project,” Karen said. Larry worked hard and met the challenges that arose with dignity. In 2016, Karen and Larry began talking again about the dreams they had of helping Native Americans in their younger days 40 years prior. They decided they weren’t getting any younger and if they were going to make those dreams come true, the time was now. So Karen contacted the Volunteers in Mission (VIM) office of the United Methodist Church and asked if there were any mission opportunities for older adults — one with a disability – who were called to work with Native Americans. Of the three mission possibilities Karen received from VIM, the first to respond to her query was Linda Garriott, the director of the Tree of Life Mission on Rosebud Reservation located in Mission, South Dakota. Linda and we knew this was the mission God was calling us to be part of,” Karen said. Church Women on Mission group from Decatur worked at least once a week through March and April to prepare the donations at the Warehouse. First Baptist in Decatur, Calvary Church in Chattanooga, Tenn, First Baptist Church in Clinton, Tenn, Eva Senior Center and many other volunteers from churches visiting the UMCOR warehouse on the days packing was taking place. The shipment from the Warehouse included UMCOR health kits and school kits, along with shoes, clothing, toys and many other items from the Warehouse. The shipment arrived in South Dakota while the group of volunteers from Gandy’s Cove was there on a mission trip. They were able to see the needs first-hand and experience the gratitude of the Lakota Sioux Reservation staff and Tree of Life Mission. Here is a report from Lutts, TN on Youtube. John Montgomery was one driver on four (4) shipments the United Methodist Disaster Relief Warehouse made to Lutts. While he was there he took some pictures and pulled others from a different source. It is about ten minutes long, but I think you will enjoy it. We would love to hear your reaction after viewing it! Also, attached in our report that goes to Sager Brown each month telling what the United Methodist supply network AROUND THE WORLD has ready to ship. In addition, see the disbursement report for December. You helped make this a reality. I just read a news report that stated around Missouri, the Mississippi River has ten (10) times the amount of water passing that area that usually comes over Nigari Falls every minute. Eleven levies have been compromised and people are fleeing the flood waters up there. This is all headed our way. If you can help, please let us know. Thanks you and may God richly bless you in 2016.